Japan’s collaborative investments in African markets are set to increase as the country attempts to offset the dominance of Chinese economic involvement on the continent. The Japanese government recently announced that it intends to establish a permanent joint council, involving government officials, economic organizations, and Japanese companies operating in Africa. The launch of the new body will coincide with the Seventh Tokyo International Conference on African Development, or TICAD VII, scheduled for August 2019 in Yokohama. Taking into account Africa’s diverse economic picture and vulnerability surrounding development effectiveness, Japan’s TICAD framework has evolved from traditional government-based assistance programs to private sector-led activities, such as trade and investment. At the 2016 TICAD VI conference held in Nairobi, Kenya, Japan pledged approximately $30 billion in public-private development assistance to Africa over a three-year period. With the largest such commitment in TICAD’s history, Japan’s relationship with Africa has become of key importance in Prime Minister Shinzo Abe’s effort to boost Japan’s global standing, not least in response to the dramatic increase in China’s power. With this in mind, the competition for African investments between Japan and China, Tokyo’s principal rival at the forefront of the regional assistance, evokes many politicized arguments on the nature of their respective interests and development tactics. In this regard, Japan adopted a number of subtle approaches in order to raise Tokyo’s profile in the continent to that of an economic partner rather than a donor. The resource-rich yet underdeveloped African continent has become increasingly reliant on Chinese foreign investment. According to trade and investment experts, if investment growth persists at half of current rates, China’s investment position would reach $100 billion by 2020, contributing significantly to the continent’s economic development. In 2018, at the Forum on China-Africa Cooperation, Beijing’s equivalent of TICAD, President Xi Jinping promised to extend funding to $60 billion USD over the next three years. Aligned to the Belt and Road Initiative (BRI), much of the Chinese development footprint in Africa has been driven by massive infrastructure projects, fueling a polarized perception of African countries becoming too dependent on the generous and open lender. Against this background, Japan has sought to frame its economical engagement in Africa differently. Japan’s message to its world partners contends: without burdening the host nation with debt, Japanese aid, grants and technical assistance will allow for a sustainable performance and autonomy in a long-term perspective. Japan presents its development aid as a more responsible model, better adjusted to attaining the sustainable development goals. Based on “principles of ownership and partnership”, Japan has adopted a two pronged approach to its economic assistance, namely; “quality growth (inclusiveness, sustainability, and resilience)” and “human security (capacity building focusing on each individual in Africa)”. Since the launch of TICAD I in 1993, the framework’s multilateral efforts have shown a track record of improving socio-economic conditions throughout Africa, by accelerating infrastructure and connectivity, developing the private sector, expanding trade and investment, and hence boosting consumption. In addition, Japan has been actively advancing capacity building trainings and assistance in the fields of education, health, water and sanitation. However, it would be overly simplistic to view Japanese motivations in African development as purely altruistic. At TICAD IV in 2008, Tokyo approached with a much stronger focus on Japan’s national economic interests, rather than utilizing it as a multilateral consultative forum. Japan has long been characterized as a nation with poor natural endowment and energy scarcity, making it dependent on the international market for natural resources. In the wake of the Fukushima nuclear disaster and the consequent effect on most of Japan’s nuclear power generation, the need for resources and energy development has certainly attracted most of the Japanese investment in Africa. Moreover, Japan’s regional exports lag significantly behind China, which is now Africa’s largest trading partner. In this regard, the Japanese had to adopt a well-coordinated strategic approach: Japan’s strong competitive advantage lies in high-tech exports, primarily in vehicle production. 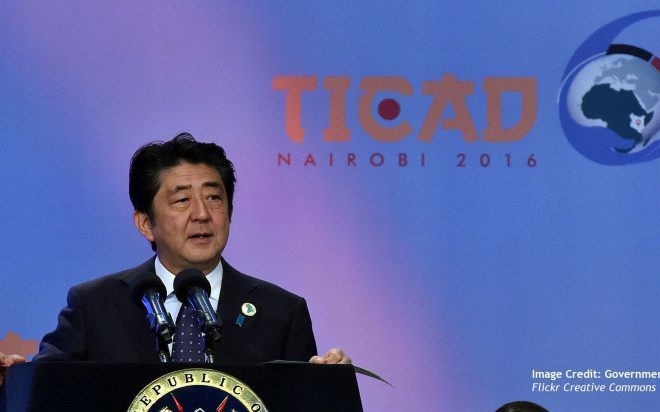 In view of the Africa’s growing economic and strategic weight, Japan’s decision to hold TICAD VI in Nairobi presented a landmark event in the Japanese–African diplomatic engagement. Since 2016, the beginning of its two-year term as a non-permanent member of the UN Security Council, Japan has stepped up its efforts to push for the permanent membership in the Council to include the G4 countries, meaning Japan, Germany, India, and Brazil. However, such a reform would most likely need to overcome Chinese opposition and gain the support of the African Union. At the opening session of the TICAD VI ministerial meeting in Gambia, the Japanese government pledged to back the call by many African states for UNSC reform, stating that the Japan-Africa TICAD commitment “will be further reinforced in our efforts on promoting peace and stability in the region, as well as other global issues including Security Council reform”. Although African nations seem to stay away from the competitive narrative and instead prefer to benefit from trade and financial backing from both China and Japan, Tokyo’s African agenda may equally address geopolitical considerations in the East China Sea. Through the TICAD process and its wider multilateral objectives, Tokyo has been increasing Japan’s diplomatic profile on the African continent as a whole. Japan’s TICAD investments in Africa have been developed in close dialogue with the United Nations and the World Bank, institutions central to the post-Cold War order. This contrasts sharply with China’s economic engagement projects in Africa which have followed an open, “no political strings attached” approach. Furthermore, Japan’s Africa policy has built on its alliance with India’s Prime Minister Narendra Modi. With the aim of integrating economic connectivity between Asia and Africa, the Asia-Africa Growth Corridor (AAGC), announced in 2017, focuses on shared economic interests between Japan, India, and African countries, bypassing China’s foreign policy ambitions in the Indo-Pacific. As the TICAD VII summit-level meeting will take place in Yokohama City from August 28-30, 2019, much of the international attention will be drawn to Japan’s commitment to the regional economic partnership with the African Union at its center. Regional solutions could be enhanced if the TICAD, the AAGC, the BRI, and Western development mechanisms functioned as a more coordinated, complementary action, however, this more than likely continue to be competitive, leaving African nations choosing between them, with little sense of an overarching synthesis for the continent as a whole.